Notre Dame will not renew its contract with Adidas. 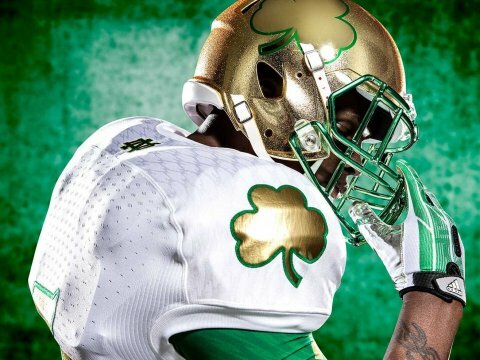 News is circulating around South Bend that Notre Dame is switching from Adidas to Under Armour. One of the most recognized brands in all of college sports will not renew its Adidas contract after 16 years. The Irish are looking for a new image for its sports teams. Under Armour is known for its creative on-field appearance (look no further than Maryland) so if Notre Dame is looking for some change in their supplier they have certainly picked the right outfitter. Notre Dame is a school rich in history and tradition, let’s hope Irish athletic director Jack Swarbrick isn’t going to sacrifice years of tradition and in some cases simplicity for dollars. Notre Dame’s classic uniforms are just fine and it would be unfortunate to see drastic change. Copyright © 2019 TheMatadorSports.com and EyeonCollegeFootball.com- College Football Headlines, News, and Rumors. All Rights Reserved.